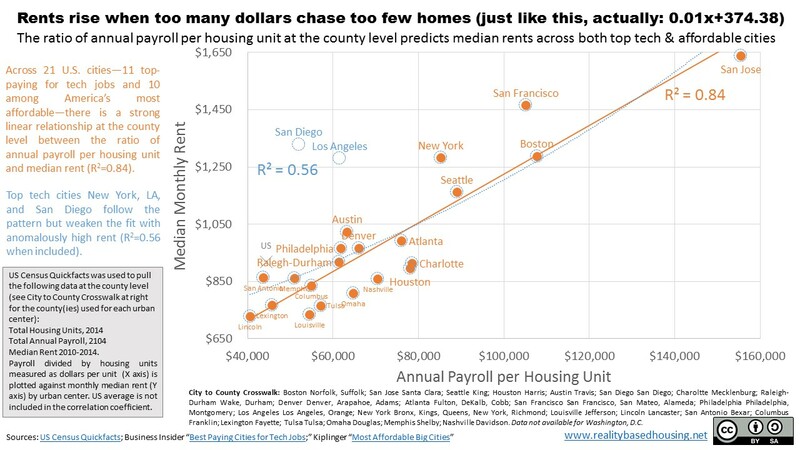 In fact, setting aside LA, and San Diego (which for whatever reason manifest much higher rents than one would expect given the pattern across 21 other cities), it’s a strong linear correlation (R-squared = 0.84). Nationwide, the ratio of annual wages per housing unit is about $44,000. In San Francisco and San Jose, it’s over $100,000. In King County we’re at just over twice the U.S. average. The upshot is pretty simple: build more housing. The pattern is clear for how much we need to add to reduce rent–and how much rent stands to rise if we don’t build to keep up with wage growth.